The sequel to last summer’s Wonder Woman has officially begun production, and this morning star Gal Gadot and director Patty Jenkins tweeted out our first look at the film, officially graced with the Orwellian title Wonder Woman 1984. 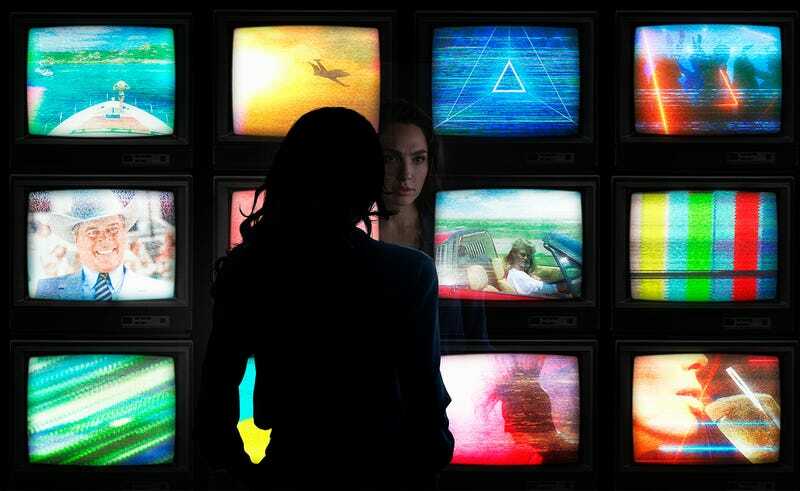 The first image—which you can see above courtesy of studio Warner Bros.—shows Diana of Themyscira pondering the neon aesthetics of the Me Generation in front of that universal signifier of the 1980s, a stack of TVs. The second also takes us to an iconic ‘80s location, the mall, where we see some ordinary folks with big ‘80s hair on their way to buy some frozen yogurt or neon leotards or something as Chris Pine’s Steve Trevor watches them suspiciously in his Members Only jacket. ...wait, Steve Trevor? He’s alive? Yes, friends, in an act of supreme comic-book logic, somehow Steve’s heroic act of self-sacrifice at the end of Wonder Woman didn’t actually kill him. He also appears not to have aged in the 70 years since the last film. We’ll find out how that’s possible when Wonder Woman 1984 debuts in theaters November 1, 2019.